Mesotherapy was pioneered in the 1950’s by French Doctor Michel Pistor. It was first known as surgical medicine because the medicine was injected into that part of the skin where there was a problem. Mesotherapy treatment was originally invented for non-surgical cellulite removal by injections. These injections break down the fat deposits under the skin and disrupt the connective bonds between the fat cells and naturally flush out the fat from the body. Then as a result the skin on the legs, face, hips and thighs are cellulite free and the contours of the body look shapely and great. 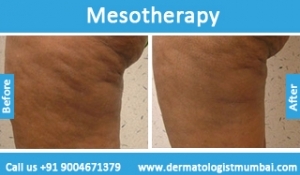 Mesotherapy treatment can be used for treating Cellulite (deposits of fat underneath skin), skin pigmentation, acne, scars on face (after acne), stretch marks, wrinkles (anti-aging), atonic skin, dull complexion, thinning of hair, hair loss (balding) etc. Moreover, Mesotherapy treatment also works wonders to improve the facial skin and body post plastic surgery/laser polishing and chemical peels. What are the indications for mesotherapy? Cellulite –Cellulite gradually increases after age 25, and if the cellulite is present on the visible areas of the body, it can create embarrassment. Further, there are many so called “cures” like massage oils that promise effectiveness but don’t deliver. 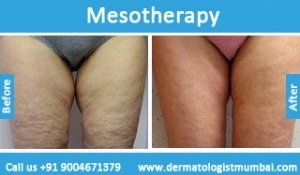 Mesotherapy treatment is good for treating cellulite. Baldness– Baldness and thinning of hair can be damaging to one’s self esteem, for both men and women. Due to age and heredity factors, hair loss can come naturally. A qualified specialist injects vitamins, minerals and DTH blockers into your scalp for rejuvenating the follicles of your hair.Mesotherapy not only helps in hair regrowth but it also helps in blood circulation in the area that allows better circulation to the hair follicles. Mesotherapy can be a treatment for hair loss as well as a preventive measure to curb the hair loss after treatment. Anti-aging – Wrinkles, pigment spots and scars on face are also a common complaint amongst people. Due to many anti-aging and skin rejuvenation products, it gets confusing which product to trust. Mesotherapy is an adjunctive therapy for this indication. Mesotherapy is used to permeate the anti-aging and lightening agents directly in the skin layers. Mesotherapy is great for aiding better product efficiency and fast results and there is no particular downtime as a result. It improves sun damaged skin, wrinkles and aging lines. Your skin emits a healthy glow post treatment. The non-invasive procedure introduces antioxidants to the facial skin and fights the free radicals to inhibit sebum oxidation. This stimulates the growth of new skin at the cellular level and normalizes the skin tone. Skin Pigmentation – Pigmentation problems like Melasma, freckles, blemishes, and even post inflammatory hyper pigmentation can be improved with mesotherapy. The technique is used for delivering skin lightening agents like vitamin C and glutathione directly into the layers of skin. The procedure is carried out with injecting the nourishing vitamins via injection gun or manually by an experienced hand. We have the best of facilities on board and offer the best of dermatologists, surgeons and equipment at The Esthetic Clinic. 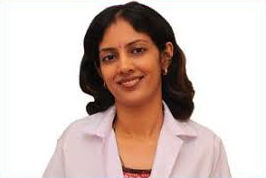 In fact, our co-founder, Dr. Rinky Kapoor is one of the most popular dermatologists all over India. She has had her degrees from universities in Singapore and USA. We offer customized services to all our patients based on individual skin type and medical history. Also, our services at The Esthetic Clinic are available at economic prices. Lastly, the treatment requirements differ from patient to patient and hence, we suggest that you take our advice before going ahead with a particular treatment. Do give us a call and set up your appointment. Sagging skin and too much fat? Here’s Mesotherapy in Mumbai to beat it! If problem areas of your body are giving you sleepless nights, Mesotherapy in Mumbai can come to the rescue. 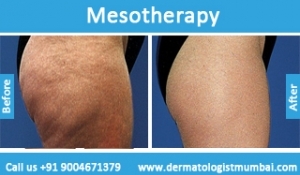 If you have sagging skin, too much cellulite or underarms that bulge, Mesotherapy in Mumbai with Dr. Rinky Kapoor at The Esthetic Clinics, can help. Ask your dermatologist about Mesotherapy in Mumbai and she will be able to guide you. 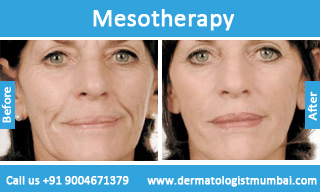 Mesotherapy in Mumbai hits the problem areas of the body to ensure that the individual looks and feels her best. The best thing about Mesotherapy in Mumbai is that it hits your problem areas. For those who have particular areas of the body where they want to lose fat from, Mesotherapy in Mumbai has the best treatment on offer. Mumbai is a city that is filled with dreamers and over achievers. To blend in a city like Mumbai, you have to look and feel your best at all times. So in Mumbai, you have to stay updated, whether it is the latest trends or your figure. If your figure is getting you down in Mumbai, getting Mesotherapy in Mumbai is the smart thing to do. With Mesotherapy in Mumbai, get rid of your fatty and saggy skin. If you have always wondered whether there was a perfect treatment in Mumbai for your problem areas, then Mesotherapy in Mumbai with Dr. Rinky Kapoor at The Esthetic Clinics, is something you should look into!